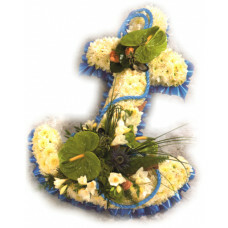 Choose from our carefully selected range of classically beautiful specialist funeral tributes and just let us know where you would like us to deliver them too. Liverpool, Maghull, Lydiate, Melling, Aintree, Aughton, Ormskirk, Bootle and surrounding area of Merseyside a little easier for you. Our funeral flowers range includes football themed tributes, butterflies, breast cancer care, dart board, gates of heaven and many more – and we can of course customise your order to make a bespoke arrangement so it’s just what you want. 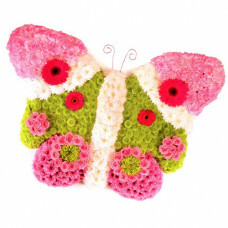 A beautiful butterfly tribute made in pinks and greens containing gerbera chrysanthamums carnations ..
Dart Board tribute - Massed in white double and Kermit chrysanthemums , with red spray carnati..
Anchor Funeral Tribute - Massed in White double chrysanthemums, edged in blue and white pl..
A Stunning bespoke funeral arrangement of the Everton Football Club Badge approx 30inch x 24 inches ..
Bespoke funeral flowers football pitch can be created in other colours approx 24inch x28inch.. Double Spray Chrysanthemums are used to create this Everton blue and white Football Scarf desig..
Five pointed star - Massed in White double chrysanthemums, edged in Red and white pleated ribbo..
Five pointed star - Massed in White double chrysanthemums, edged in blue and white pleated ribb.. 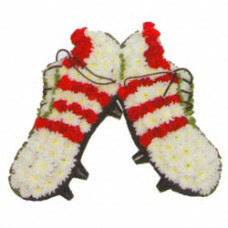 Double Spray Chrysanthemums are used to create this bespoke funeral arrangement red and white Footba..
White double Spray Chrysanthemums are used to create this red and white liverpool Football Scarf&nbs..